Tanner - "We were not in debt under Whitlam"
“In the period when the Whitlam government was in office, most people would be surprised by this, Australia had negative net debt,” Mr Tanner told ABC Television on Monday night. “We were not in debt under the Whitlam government. Note carefully: that’s not one, but two intriguing claims. That Whitlam had (1) Negative Net debt, and (2) no debt. I’ve done a little digging in the RBA Statistics archives, to see if Tanner was telling the truth. The results so far suggest that he lied. True enough, the RBA’s spreadsheet “ho5hist.xls” – which lists Australia’s historical Net Foreign Liabilities – does not show any Net Foreign Debt during the period of the Whitlam Government. Tanner claimed that under Whitlam, Australia had “negative net debt”. But for the period Whitlam was in office – December 1972 to November 1975 – the RBA historical data does not show any records of Net Foreign Debt at all. In fact, the very first entry for “Net foreign debt (Official)” – as distinct from “Non-official” – is for the end of June 1976. Eight months after Whitlam was sacked by G-G John Kerr. For Tanner to claim that Australia had “negative net debt” during the period Whitlam was in office, when the RBA’s records do not even begin to show Net Foreign Debt at all until 8 months after he was ousted, begins to smell of the old “Look! there’s a unicorn!” distraction tactic by a fairground trickster. It begins to positively reek, however, when we see that his claim that “net foreign debt” was negative under Whitlam – even if true, which the records do not support – would hardly be anything to crow about. Why? “Net foreign debt (Official)” is still negative, at end September 2009 (data to end Dec ’09 is not yet updated). All of Australia’s “Net Foreign Debt” – all $637 Billion of it – is listed in the “Net foreign debt (Non-official)” category. 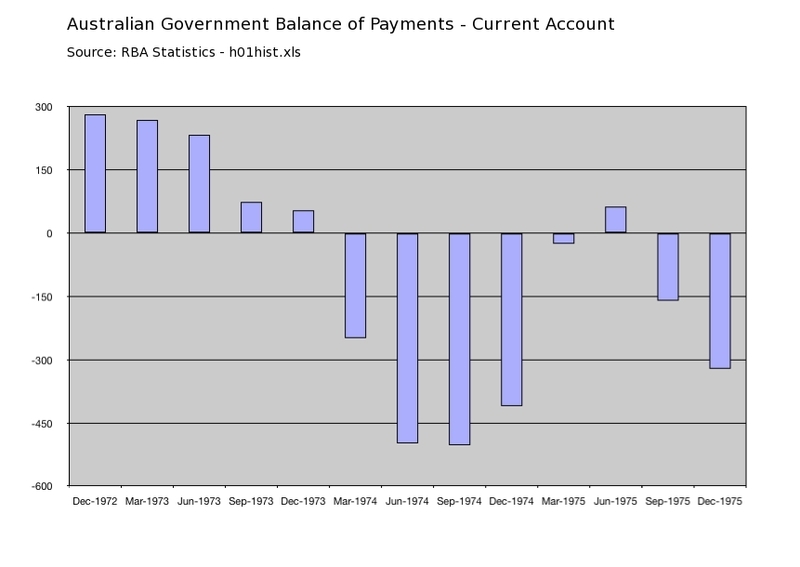 And the real kicker here, is that the RBA only shows records for that category beginning at end of June… 1982! If that’s all just a little too confusing for you, then let me summarise. Tanner pulled a fast one. It’s called “Lies, damned lies, and statistics”. Watch this video – just the first 2 min 33 sec – to learn all about the use of government statist… “facts”. Tanner’s second and categoric claim that “we were not in debt under the Whitlam government” also bears investigating. “No debt”, Lindsay? None at all? Digging further, I found another spreadsheet listing historical Australian Government Budget surplus / deficits (“E02hist.xls”). From that data I made the chart of the Whitlam Government’s Budget performance (above). 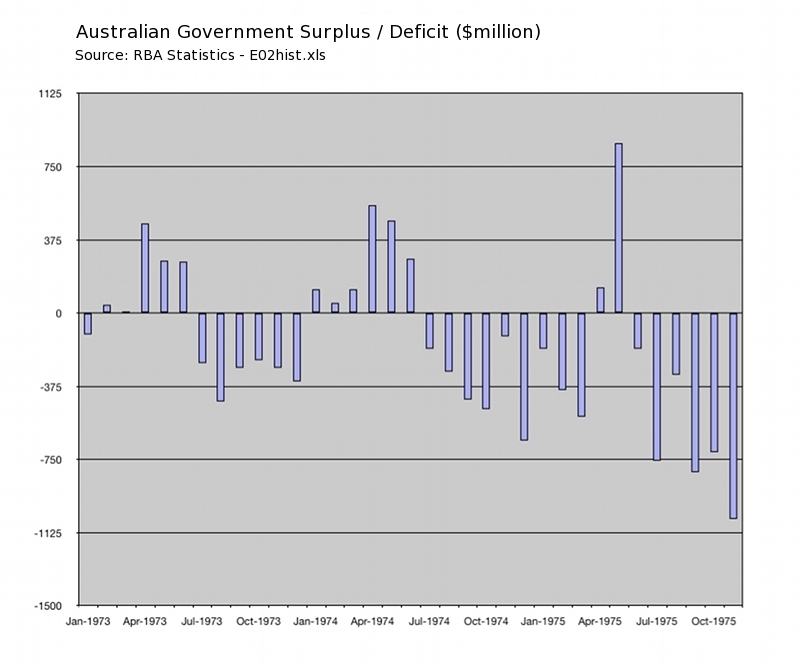 Perhaps Tanner can explain just how it is that “we were not in debt under the Whitlam Government”, when the official RBA records show the Budget was in deficit for most of the Whitlam era, and growing steadily worse at the end? Finally, if “we were not in debt”, perhaps Tanner can also explain why the Whitlam Government (illegally) tried to borrow up to US$8 Billion from middle eastern countries via Tirath Khemlani, triggering the still-infamous Loans Affair scandal? “We were not in debt under the Whitlam Government”. Tanner is not just an economic illiterate. It appears that (as my big sister would say) he’s simply “a filthy liar” too. Tanner admitted that Whitlam spending rose quickly, but then said taxes rose quickly too. Implying that higher taxes is the reason why there was “no debt”. Thanks Lindsay, for confirming what everyone knows. That when a government goes on a spending binge, taxes rise. Oh, and just one other thing. 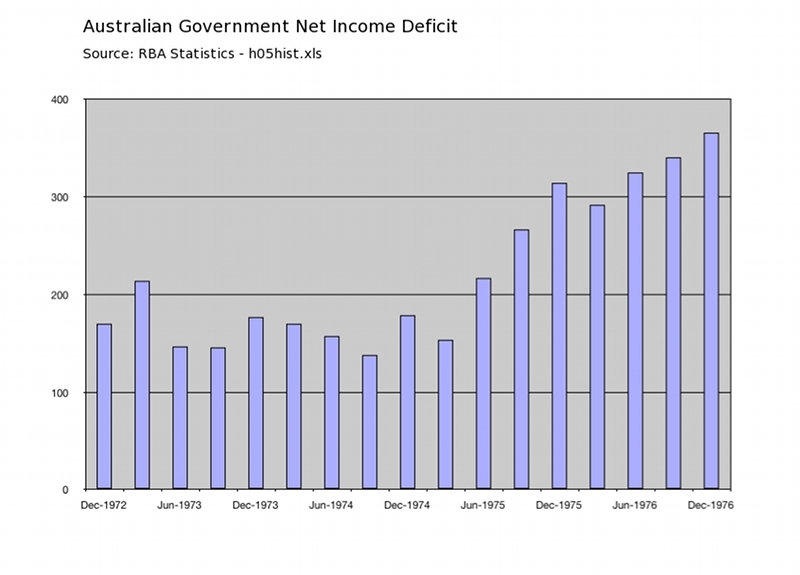 That Net Income Deficit chart (above) suggests that taxes did not rise anywhere near quickly enough for the Whitlam wastrels to balance the books. Very neatly explaining why they felt the need to go illegally a-huntin’ for up to US$8 Billion in foreign loans via Khemlani.